Obesity is one of the biggest health problems in the world. People gain weight due to sedentary lifestyle and poor diet, and it can lead to many health problems such as diabetes, cardiovascular diseases, cancer, hormonal problems and difficulty breathing. Do you want to experience these problems? If your answer is no, you should change your lifestyle and develop new, healthy habits. Scroll down to find out how to do it. It can be really hard to get your body in shape. It will require time and patience to change your lifestyle, but you do not need to push too hard, especially when you are at the beginning of your weight loss journey. It is not necessary to exercise two hours a day, seven days a week, as it will not produce the desired results. Why don't you choose the easiest way? 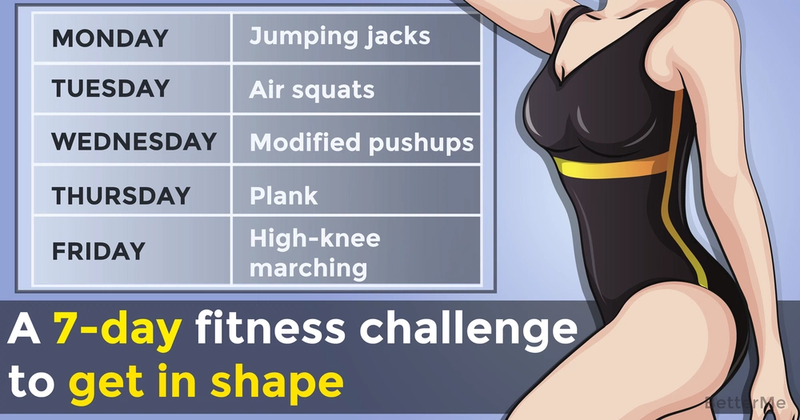 That is why we would like to show you this seven-day fitness challenge. If you want to lead a healthy lifestyle, you should start to follow this challenge. This challenge consists of seven moves that you can perform in order to strengthen your core, build muscles and burn extra fat. If it is too difficult for you to do this workout at once, you can break it into two or more parts. Your aim is to exercise regularly, pushing yourself hard to develop strength and resistance. It is crucial to consult your doctor before starting any training routine, in order to prevent injuries. Remember that you cannot obtain great results if you continue eating unhealthy food. You should balance your diet with all essential vitamins, minerals and antioxidants. Eat more lean proteins, raw fruits and vegetables, whole grains and nuts, and drink plenty of water. Are you ready to start your new life?